The French Open title now coming to an end with ladies single final finally ending in J. Ostapenko favour who beat S Halep today in an easy win over final. 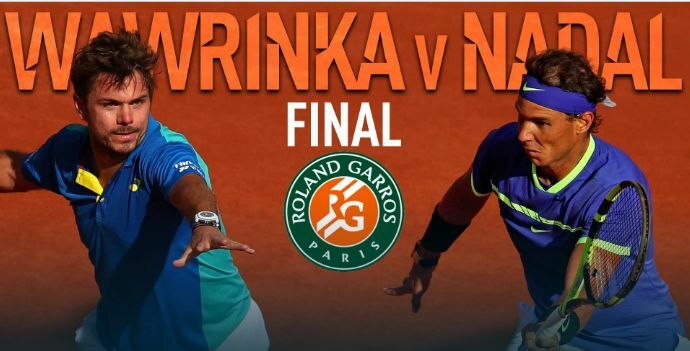 But the men's final on Sunday today will be a great final for it is French Open master and nine time winner Rafael Nadal is appearing to take his 10th record title when he meets Stan Wawrinka of Switzerland today. Rafel Nadal who has shown his resilience despite his injuries to reach the final beating sixth ranked D. Thiem in straight sets 6-6, 6-4 and 6-0 may carry the day against his opponent Wawrinka whom he had a favourable record of winning 15-3. His latest win over Wawrinka was at ATP World Tour Masters 1000 Monte Carlo in 2016.